In choosing RE/MAX, you will be using the largest real estate company in the world. What this means for you is that you as the client will receive a world class experience with an excellent outcome! RE/MAX Regency knows there is no place like home, and our award winning team is committed to helping you get there. Established in 2008, RE/MAX Regency has grown into one of the most successful RE/MAX offices in Australia, consistently placing in the top 5 for Australia & New Zealand. These results have come from the dedicated efforts of our dynamic team who live the 'customer is king' philosophy and are not willing to compromise on their integrity or professional service. At RE/MAX Regency we believe that the more we engage with our clients the clearer things become and the easier it is to determine what we should be doing to serve them better. Backed by RE/MAX international, the world leader in real estate, the professional team at RE/MAX Regency is able to offer you access to industry leading tools, strategies and advice that will help achieve your real estate objectives in the shortest time possible. Buying or selling, our clients can rest assured that we offer professional services that will help them to make one of the most stressful decisions, a simple and stress free process. Our prime location at Suite 15 Robina Super Centre, 86 Robina Town Centre Drive, Robina, provides great exposure to hundreds of vehicles on a daily basis as well as easy access for our vendors and potential buyers to come and meet with the Team, and get the best coffee in town. You will be receiving state of the art marketing that is at the forefront of the current needs with regards to selling a property. This and the superior negotiation would be able to assist in you achieving the goal you are after. 25 linked websites that distributes nationally and to Asia. At the moment there is an abundance of buyers looking for property in the area. Selling properties in this range is a fairly quick process just because of the current demand. Professional and genuinely helpful Charl! I highly recommend Charl's services! He did everything in his power to make the process of selling our house as smooth as possible and helped in every aspect. He works hard to get things moving! 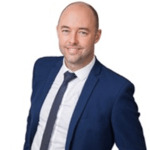 From our initial meeting with Charl we were impressed by his passion and enthusiasm for selling property and knew that he was the right person to handle the sale of our house. Throughout the entire selling process Charl was the "Ultimate Professional". He was always available to answer our numerous questions; he kept us well-informed at every step along the way and consistently made us feel as though the sale of our property was his top priority. Charl has a commendable work ethic - he is energetic, efficient, punctual, considerate, attentive to detail and totally honest and reliable. Charl's extensive knowledge of the local market enabled him to devise and implement a marketing strategy which resulted in an excellent offer being presented and accepted within 3 days of the first Open Home. All our dealings with Charl were both pleasant and positive; he went out of his way to ensure that our selling experience was smooth, well-organised and stress free. We would highly recommend Charl to anyone choosing to sell their property.